This pages shows you how to use OpenCBM on your Mac. As modern Macs only support USB connectors and no parallel ones, we focus on setting up the XU1541 or XUM1541 devices including the new ZoomFloppy hardware. First you need to setup MacPorts (if you haven’t already installed it on your machine). Download and follow the Installation instructions there. Follow all steps there exactly and also install the XCode Development Environment – otherwise your build will fail! This version is not necessarily stable! That’s it! OpenCBM is now installed on your machine! That’s it. Your device is now configured! Your purchased ZoomFloppy device is shipped fully setup. Nothing needs to be done here. Have a look at the ZoomFloppy User’s Guide for information how to connect the devices and your Mac. Don’t forget to directly attach the ZoomFloppy to your Mac. Do _not_ use a Hub in between! Now download the XUM1541 prebuild firmware from OpenCBM’s Git Repository. Pick a *.hex file suitable for the ZoomFloppy (e.g. xum1541-ZOOMFLOPPY-v06.hex). Nate Lawson’s Firmware supports different hardware implementations. Currently only the ZoomFloppy is commercially available (see above). All others are more or less prototype setups. In this case you need to build the hardware yourself. See the XUM1541 Homepage for details on how to build the HW. It works well with Macs and I use one myself built from a USBkey development board available from Atmel. If you built the HW you need to flash the firmware. Now download the XUM1541 prebuild firmware from OpenCBM’s Git Repository. Pick a *.hex file (e.g. xum1541-AT90USBKEY-v02.hex). That’s it. Reset your device again and the new firmware should be up and running. 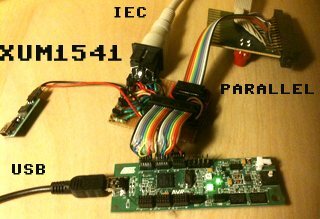 The XU1541 firmware and hardware was developed by Till Harbaum. He discontinued the project but Spiro Trikaliotis kept the information on the web. See his XU1541 Page for details. There you can find schematics to build your own device. > cbmread 8 "how to use"
So these are the most useful commands at a short glance. If you want to explore more of OpenCBM’s tools then you can call each cbm* binary with the –help switch to get more information on options and usage. Now enjoy OpenCBM on your Mac! I had some strange problems when following your tutorial. First I had to change the directory to “cd ports” before starting “portindex”. Finnaly it works great, to some extend. Sometimes I get errors where the usb device is gone due to bad errorhandling. Generally speaking I would really love to have a tool that is like sta commander on mac. 😉 I am no coder at all, but would love to assist when it comes to UI and graphics in general. What do you thing? One package, whith a proper installer and a mac like interface for mousepushers like me. Besides: Great tut. Without it (and a firends help) I would have booted my mac to the darkside. Hi. Just can´t install it. When I type “portindex” I only get zeros. No matter what path I´m in. What has the name of the portfile to be like? When I download it, it´s just a Text-file. I also “hand-typed” it with vim, but portindex does nothing. What am I doing wrong? Ok, several problems here. I agree with some of the other posts, these instructions are not 100% correct, and the other major problem is that the Portfile link seems to be dead. I reworked the whole page to make install for ZoomFloppy users more obvious. I also put all required source code on my site to work around the SF.net downtime. I hope setting up is now easier for you… If still problems arise please give me a note what needs to be added to this page. Perfect, this works now. Thanks for everything man. Error: Target org.macports.build returned: can’t read “build.cmd”: Failed to locate ‘make’ in path: ‘/opt/local/bin:/opt/local/sbin:/bin:/sbin:/usr/bin:/usr/sbin’ or at its MacPorts configuration time location, did you move it? Any thoughts? looks like it can’t find the file. And then when I go and see if my drive is detected I get “ERROR: No xu1541 device found”. Any ideas how I can fix this? I did get zoomfloppy configured to work with a 1571 finally. Will it work with a CMD FD-2000 drive? I seem to be having some problems with that so far. Thanks for any help anyone can give me with this. So sorry to bother you again. Couldn’t get the FD-2000 to work correctly but work around it just by transferring files to 1541 disc and then to d64 images and then using fcopy+ program from CMD to copy files to d71 or d81 images. The only problem is that the REL files I have , fcopy+ won’t copy. Any reason why you think I am having this problem? Any help would be greatly appreciated. Anyway, now I’m getting an error about firmware too low. Does the ZoomFloppy need to be updated? yes the error messages tells you that the openCBM binaries require a newer firmware. Just download and build Nate’s firmware upgrade tool from his page: xum1541. Unbelievable — this is the only useful openCBM/zoomFloppy tutorial on the entire internet. And for OSX, no less. Thanks for taking the time. I had no luck in finding a newer version of the plugin. Any hints what to do now? Fixed it 😉 Just had to re-install opencbm from the GIT. Nate helped out in a great way over there at the Google usergroup. Thanks for your works, it’s very appreciated! I’ve obtained some errors with my OS X Leopard… the working way is to install before “The most recent Portfile found in OpenCBM’s Git Repository” and later others ZoomFloppy Portfiles. Power Mac users now have a versions that works, since I couldn’t get this one to work with my IBook. just managed to get my xu1541 to work with my mountain lion imac. no problems at all, just followed your instructions. Hello! Thanks for the efforts. OpenCBM compiled fine and works with ZoomFloppy now! Thanks. A question though: have you ever managed to get it work with VICE? I compile my vice sources myself and do NOT use the bundles. Just regular unix style commands (–disable-bundle) but I always get “Real Device: Real device emulation is not available!” whenever I try to set the access to real device.. Any clues? Thank you in advance. Replying to myself: There are two issues with VICE (as of 2.4). First it looks for opencbm library at a hardcoded (and invalid – sic!) path. To correct the problem one has to modify #define OPENCBM_SO_NAME in opencbmlib.c file. Second issue is that it supplies its own (sic!) opencbm.h file in its source tree. This file in VICE’s sources is outdated and causes compatibility problems on 64-bit systems. Removing the file and its entry from noinst_HEADERS secion of Makefile allows the build process to find the correct header file (of course include path has to be set properly!). After those modifications OpenCBM works fine from within VICE! I’m not sure what to do next. My ZoomFloppy is running firmware v7. @Robert: as suggested in the error message please have a look in the main.log file… There a detailed error report is given. @Lallafa: I did read the log which is long and extensive… I can’t make sense of it. Is there any jargon in particular I should be looking for? Cheers. Just post the last 10 or 20 lines of the log here… Then I’ll have a look.